Barcelona were dumped out of the Champions League during the week as they fell to a humbling 2-0 defeat at the hands of Atletico Madrid in their quarter-final, second-leg battle at the Vicente Calderon. Antoine Griezmann proved the match winner on the night with a deadly double to sink Luis Enrique’s men 3-2 on aggregate. Netting in either half, the France intenational’s 36th and 88th minute strikes sent the home faithful wild to secure their place in the semi final stage of Europe’s elite club competition. Barca were looking to become the first team to ever successfully defend their UCL crown, but Atleti manager Diego Simeone ensured they couldn’t claim one purposeful step towards achieving that by way of a great performance. So, let’s take a look at how they managed it. Holding a fine margin of victory from the 2-1 result they had managed to eke out at the Camp Nou in the reverse leg, the Blaugrana gave themselves a slight advantage of reaching the last four, but Atleti had other ideas – and they implemented them with perfection. Lucho’s men have now won only one of their last five games and this is the first time since as far back as April 2014 that they were unable to score in successive games, so it’s safe to say that they have been experiencing a rather turbulent period in their 2016 campaign. However, the main reason the reigning Spanish champions failed to deliver during the week was because they came up against their genuine match. Los Colchoneros were in their element in front of their raucous home fans and they used that deafening support to carry them through the night. Instigating a high press, they not only did the gritty donkey work deep in Barcelona territory, but absolutely everywhere around the pitch. The Catalan outfit rarely had time to settle on the ball the way they normally like to, they were forcefully removed from their comfort zone, and it was all down to the relentless running and dedication of Atletico. It was a pan-pitch sort of defence and it would be a great disservice to the home team to label what they achieved as merely an uber-effective parking of the bus. Yes, as the match wore on, they were forced to sit back deeper and they employed more than an element of cynical tactics but for the majority of the time it was simply an honest performance full of hard graft and concentration that earned them a deserved victory and passage to the next round of games. If this match-up was lost for Barca thanks to two goals from Griezmann, Los Rojiblancos were allowed the opportunity to sink one of their biggest rivals, in part, due to what went down in the first leg. As we saw, Enrique’s troops weren’t good enough to severely punish the 10 men of their opponents in the opener and that lack of clinical finishing really carried itself over when they made the trip to the Calderon. Lionel Messi, Luis Suarez and Neymar were a far cry from their usually dazzling selves and although they were hindered greatly by a hard-working, focused team display, one can be sure the Barcelona fans will have expected a great deal more from their star-studded trident. They’ve been producing the goods all season, but try as they might they just couldn’t muster one last moment of sweet genius, and they paid the price for it. There were quite a number of striking statistics and figures doing the rounds in the aftermath of the result, but one that really caught the eye is the fact that current Ballon d’Or holder Lionel Messi has now gone 452 minutes without scoring a goal. Some will speculate that this great club are going through a natural slump after such an extended, exhilarating high and that the failure of their famous trio to perform was merely a byproduct of that. Others will go one further and say that Atletico caught them at the perfect time. 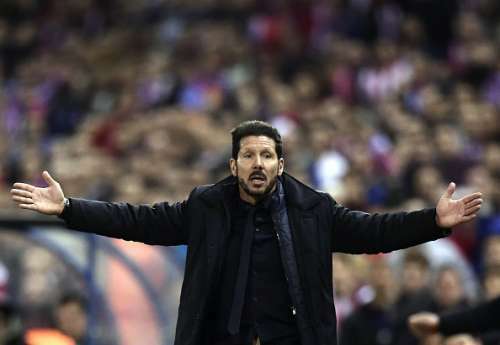 The truth is perhaps somewhere in between; this downturn in form was always coming, but Atletico had key players in inducing it and their warranted victory was far more as a result of genius design than accident. 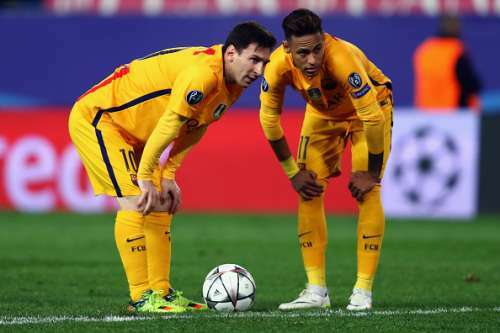 For as long as MSN have been grabbing the headlines, Barcelona’s defence has hovered like a sorry spectre. Ever-present as a niggling worry, their defenders have been a real cause for concern. That said, the strikers have always done more than enough to ease those fears with an avalanche of goals, but Atleti really went after the line of players sat in front of Marc-Andre Ter Stegen’s goal so that on this occasion they had absolutely nowhere to hide. Indeed, for the opening goal where Saul Niguez produced an otherworldly cross to set up Griezmann, it was Gabi and Koke who were pulling the hard strings to unsettle Barca at the back. Pressuring them into a hurried clearance, Koke’s presence ensured the ball didn’t travel far and the Atleti captain was on hand to pounce before knocking the ball into Saul’s path – the rest was poetry. It really was next level football, but it provided a window into how to give one of the best teams around a tough time and how, despite all their passing brilliance and coolness under pressure, they can be ruffled, they can be upset and they can be beaten on the big stage. Like clockwork, they looked to expose the Barca back-line and they had the measure of them so often, whether it was on the counter-attack through Griezmann or simply by way of a high press. Ultimately, the second goal of the night highlighted their plans best of all as it was Filipe Luis who dispossessed Sergi Roberto before stampeding the length of the field to earn a penalty. Facing Barcelona is never an easy feat, in fact Atleti had lost the last seven encounters, but Simeone really got his tactics right this time out and instead of wondering how to stop MSN, how to score more than them or how to negate the influence of their midfield – he focused on all three by sending his players out to terrorise them like performers possessed.